The story of the camera, and the campaign that helped reveal the criminal acts perpetrated by Israel's military occupation of the West Bank. 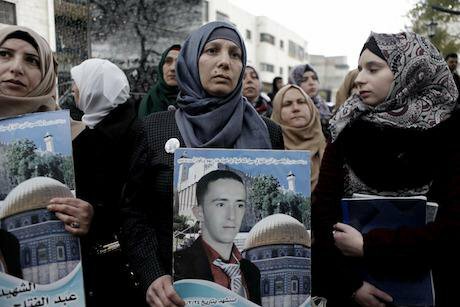 The mother of Palestinian Abdul Fattah al-Shareef holds his poster during a protest in the West Bank city of Hebron on Jan. 4, 2017. Picture by Xinhua SIPA USA/PA Images. All rights reserved. Media all over the world have covered the case of the killing of Abdul Fattah al-Shareef, the Palestinian teenager who was shot in his head in cold blood by Israeli soldier Elor Azaria on 24th March 2016 in the Tel Rumeida district in Hebron. Hebron, the largest city in the West Bank, is unique among other West Bank cities in that illegal Israeli settlements are distributed not only at its periphery, but also in the heart of the city, including in Tel Rumeida. These are accompanied by military checkpoints spread out over the city centre preventing the free movement of its inhabitants, and dividing the city into isolated sections which have become a sort of exhibition of contemporary apartheid, or - from the point of view of the terrorised inhabitants who remain - a ghost town. The wide publicity which the video of this particular killing received is a good and important thing, in so far as it helped to reveal the criminal acts which are perpetrated by Israel’s military occupation of the West Bank - the founding purpose of our group, Human Rights Defenders. Yet, there are facts that have seldom been spoken about in the Israeli media, or indeed the international media, which continue to rely disproportionately on Israeli media sources for its information. In particular, international media has had little to say about the story behind the filming of the attack. It wasn’t just good luck that placed a camera in the hands of a local Palestinian resident on that day in March. Rather, it was the result of a long, difficult campaign to organise a community. Let’s start with the camera that Imad Abu Shamsiya used to film the killing. As it happens, that particular camera was one of four which were donated by a group of American activists based in northern California. We received them after the Israeli army broke into my house roughly a year ago, and began to trash its contents. I’d been filming an incursion by the army into my neighbourhood as they carried out warrantless searches of nearby houses. Perhaps ironically, that’s what attracted their attention. The film was distributed online, where it caught the attention of our generous Californian partners who went on to donate the cameras. In turn, we distributed the cameras to vulnerable families in the neighbourhood, forming the basis of an expanded campaign of citizen journalism which we decided to call ‘Capturing the Occupation’. In what is becoming a familiar pattern, the attempts of the military forces occupying our communities to suppress our documentation of their violations of our rights in order to hold them accountable, produce further violations which end up increasing our resolve, and that of our growing network of international partners. Imad Abu Shamsiya and I founded Human Rights Defenders in 2014 with precisely this purpose: to document crimes and violations carried out by the occupation. At the time, I had just finished working on a campaign to free the imprisoned lawyer Shireen Issawi, and as a result I’d been invited to Geneva with Shireen’s parents to contribute to an Al-Jazeera film. The experience stuck with me. I was struck by just how strong a global response a local campaign like this one could produce. Imad, meanwhile - formerly a professional wedding photographer - was already building up a local reputation for his film work. One of our main goals in establishing the group was not just to do citizen journalism ourselves, but also to produce a body of Palestinians who were active in this media work as well, and in other forms of nonviolent resistance. We consider media work to be particularly important for exposing the crimes of the occupation to the world, applying pressure on institutions such as the International Criminal Court to take action, and helping to counter the false narrative that is often advanced by the global media. What happened in the military court last Wednesday was a media performance aimed at dispelling the image of Israel the world saw when they watched an Israeli soldier who - fully aware of his actions, with premeditation, and in front of witnesses - opened fire on a boy, Abdul Fattah al-Shareef, who was lying on the ground and did not pose any threat to anyone around. The strength of Imad’s video is precisely that it reveals all these details so clearly, even though in the end the Israeli judges came to decide on a charge of manslaughter - a charge that implies the absence of an intention to kill. Once again, Israel has failed the test of integrity and justice required of a democratic state. We see the trial more as political theatre with the aim of projecting democracy and justice, than as a real thing. It is a smokescreen designed to get Israel off the hook and weaken the case for taking incidents like these to the International Criminal Court. The ruling falls short of justice. But thanks to the work of Imad, the truth of the matter can no longer be easily concealed. This is the right of the Palestinian people, and the right of all those who support us worldwide. We are proud, at Human Rights Defenders to have been the ones who documented the killing of Abdul Fattah al-Shareef.